RFDTV is a blessing for fans of older country music, as they show The Porter Wagoner Show (with both Norma Jean and Dolly Parton as the featured "girl singer") and The Wilburn Brothers Show (their "girl singer" was a gal by the name of Loretta Lynn), as well as other shows featuring live performances. At least RFDTV hasn't forgotten the Wilburn Brothers. It appears everyone else has. CD Universe shows a whopping one Wilburn Brothers collection available. That's woeful for a duet that recorded with Webb Pierce and Ernest Tubb, had over thirty charted songs, started the career of Patty Loveless, and had their own highly successful syndicated television show. There are artists who've recorded less music in their entire career who have more CDs available than the Wilburn Brothers. That's downright pitiful. Without question, Teddy and Doyle Wilburn were not the best-liked individuals in Nashville. Their reputations as SOBs (and that does not stand for "Southern Ohio Businessmen"!) is sadly well-known. Their Sure-Fire Music publishing company owned the rights to Loretta Lynn's songs, and for years she refused to perform her own self-written tunes so as to not give a penny to the company (and, by extension, the Wilburns). The Wilburns and Lynn played a game of suit/countersuit in the early 70s. There's nary a mention of them in the biopic Coal Miner's Daughter. However, much the same can be said of Webb Pierce. Pierce had a nasty habit of claiming half songwriter's credit for changing an article in a song or a note. It was no coincidence that, even though there was ample opportunity for the CMA to honor him during his lifetime, Pierce died without being inducted into the Country Music Hall of Fame. (In fact, a cancer-stricken Pierce admitted in an interview in the summer of 1990 that he was hoping to live to see the CMA awards in October, certain that he was going to be the Hall of Fame recipient [no doubt based on the "dead and dying" notion -- die (e.g., Patsy Montana, Tammy Wynette) or have serious health problems (e.g., Marty Robbins, Tennessee Ernie Ford) and your chances for induction increase dramatically]; however, the 1990 inductee was another seriously ill performer, Tennessee Ernie.) Pierce was not inducted for ten years after his death despite having more #1 hits in country music than anyone in the 1950s, and when he was inducted, it was with nine other acts, so he never received the singular spotlight. That's a long time to carry a grudge. Doyle Wilburn died of cancer in 1982. When Teddy died, days short of his 72nd birthday in 2003, I truly expected the ill feelings to be buried with him. Alas, it has not happened as of yet. Loretta Lynn has (to date, unsuccessfully) sued Sure-Fire to recover the songs she wrote while under contract to them. Teddy's family was none too pleased with his will establishing scholarships for college students but passing nothing around to his relatives. Are these bitter feelings, some of which stretch back to the 1970s, keeping the Wilburn Brothers out of the Hall of Fame? More significantly, are they keeping the Wilburns' music out of the CD bins? There would be few things more sad than to think that the world is being deprived of some of the greatest country music of the 1960s because people are still burdening themselves with resentment. vHi! Thanks for helping keep the Wilburn's name in the forefront. But you should know that Chuck Chellman (Paradeofstars.com) and Stacy Harris (http://www.countrymusicreport.com/Stacyharris.htm) are regular writers about the "wonderful" Wilburns and strong proponents for their induction. Additionally, no less than Former President G.H.W. Bush, Ark Gov. Mike Beebe, Former Ark Gov (Presidential Candidate) Mike Huckabee, the entire Government of Hardy, Ark (their hometown) and (hopefully very soon former President Bill Clinton) have all gone on record with recent letters to the CMA asking for their induction in the HOF. The fabulous town of Hardy, Ark had their first annual Wilburn Brothers Tribute last may and will have them from now on. They are also planning a museum. Wilburn items (including cd's) can be bought at www.wilburnbrotherstribute.com and proceeds go to the museum fund. Yes, there are still some ways to go to get them back in the stores in larger numbers, but forgotten? Hell no! Thanks for the article - keep telling the folks about them. The Wilburns' TV show is a very happy childhood memory of mine. Their music was outstanding. I firmly believe they should be inducted into the Hall of Fame, and that their catalog should be reissued on CD. As long as they are "in the background," so to speak, I'll continue to remind anyone who'll listen that they are missing from the list of greats. By the way - you can see the video of the Hardy, Ark WB Musical Tribute at the Wilburn Brothers my space website. This is a really, really, really SORE spot with me. I knew T & D very well and spent a lot of time with them so my feelings are very biased. Teddy could have and should have remained a vital part of the industry, but, when Doyle died, he really didn't care anymore. Teddy was a brilliant man. Publishing, booking, artist development, television...it's unreal all the things they did for country music and for the industry as a whole. There was no mention of them in CMD because they wanted to take historical license with things and Doyle said "No way." That was that. Breakups are very difficult for both sides. Loretta wrote lovingly of the Wilburns in her most recent book. A shame money gets in the way of most things. Thing is, Teddy helped Loretta with many of her songs and didn't take any writers credit. If it weren't for Teddy & Doyle, Loretta would still be living in Washington State. Teddy and Doyle are very lovingly remembered by more people than those who remember them as SOB's. They were very stubborn indeed, but, they were also very interesting, funny (especially Doyle) personalities. I miss them both a lot. Doyle's ex-wife, singer Margie Bowes, is still one of my mother's best friends. Margie was (and still is) a phenomenal singer. I wish somebody would re-release her recordings. I think eventually they will get their spot in the HOF. 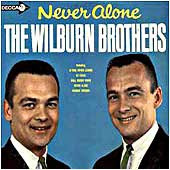 I have been a Wilburn Brothers' fan since I first saw them at the Grand Ole Opry in 1963 (45 years ago). I also think they are the greatest brother act in country music history and should definitely be inducted into the Country Music Hall of Fame. The Wilburn Brothers did so much to help other acts in country music. I liked Loretta Lynn until she treated the Wilburns the way she did. I understand that contracts are broken every day but those wanting to break the contracts should expect to pay to get out of it. Loretta Lynn played that "they took advantage of little ole ignorant me card" and unfortunately it worked. Anyone that every saw the Wilburns and Loretta Lynn in person or on tv could see how supportive they were of her career. When I first saw the Wilburns, Doyle was married to Margie Bowes. I often wondered why she wasn't on their show instead of Loretta. It just shows how much they supported Loretta's career, even to the extent of choosing Loretta over Doyle's wife. I am quite sure that was a real sore spot with Margie Bowes, as it would be with any wife. I know Loretta's actions hurt the Wilburns terribly and that's hard for me to forgive. I also did not understand why in her latest book Loretta felt the need to say that Doyle's drinking contributed to his death. Everything that I read said he died from cancer. She was out of line making this remark. It was hurtful to his family and fans. As soon as Teddy was gone, she sued for her songs. Many of which I am sure Teddy co-wrote. The songs belong to the Wilburns' publishing company. Again, she wants to renege on her contract. I have recently been purchasing some of the Wilburns' albums. I have even had to order some from the UK but they are definitely worth it. I have fallen in love with their music again. I had the great pleasure of seeing them several times at the Opry and also in my home town. I got their autograph but I never got to meet them. I would love to hear some stories from those that did have that privilege. I am surprised to hear that the Wilburns were not well-liked. They seemed to be so likeable. I miss them terribly. Does any one know if Doyle ever remarried or if Teddy ever married?I never heard if they did. I was heartbroken when they stopped touring and then I married and lost track of them for a while. Thanks Raizor's Edge for keeping the Wilburns name in the forefront. They earned their place in country history and Nashville should give it to them. As with everything else, it's all politics. I am a fan of the Wilburns, and here is what I know about the CD Situation. As for CD Reissues, I understand that at some point the Wilburns got back the rights to their albums from Decca/MCA, and that their heirs now own the masters and the rights to use them. It is my further understanding that the Wilburn heirs have contacted Bear Family Records of Germany several times about doing a box set on the Wilburn Brothers, but Bear Family is not interested at this point. On one Wilburn Brothers show Lorretta Lynn appeared along with her sister Peggy Sue, her brother sang a song, and Peggy Sue's daughter Doyletta(named for Doyle Wilburn and Lorretta Lynn) appeared at the end of the show. That seems pretty supportive. My husband and I love the Wilburn music. We are happy that the Wilburn Brother's Show is on TV. They should be in the CMH - as Teddy once said, "They have people in there that even say they aren't Country!" I got sick and tired of Loretta's whinning and the attempt to promote her family who I don't think can sing!! She would never have made it without Teddy & Doyle.She is a backstabber. We must remember the shoulders we stand on - the people who put us where we are. She wants to be careful some of those "spirits" running around her house might be Teddy and Doyle - no they are Christian gentlemen they won't be in her house. Loretta lynn would not have become famous without the Wilburn Bros., she needs to give them credit and be grateful they put her on their show, for you have to have that first break to make it!!! To me, she's a selfish ungrateful person, who's only interested in money.. Who did she ever promote or help besides herself???? I miss the Wilburn Brothers. I think they deserve to be more recognized. We need to all work to try to get the Wilburn Brothers in Country Music Hall of Shame, excuse me, Hall of Fame. The Wilburn Brothers promoted country music and many, many artists to the hilt... All these new "artists" I don't call them that, for they don't know how to work or promote anyone but themselves, should get on their knees everyday.. For without the work & sacrifice of the Old ones, they wouldn't have a stage to make money on!!!! .Teddy and Doyle were absolutely THE BEST..they certainly should be in the country music hall of fame.....Loretta in my opinion was blessed to have the Wilburns ..they helped her every way possible in her career..was she thankful ? NO. I was SHOCKED to learn the Wilburn Brothers weren't in the CMHF. As a matter of fact, I would have lost money if someone would have bet me on that one! What a shame they have been ignored! Musically they had the hits, concerts all over the world, members of the Opry, A TV show that continues to bring country music to the masses and not to mention a harmony that is tough to match! Come old Nashville power elite - give the Wilburn Brothers what they have earned and rightly deserve! These guys were very good entertainers. Our family watched their show, when I was a child. All the grumbling and bellyaching is wasted breath. Yes, they made their mark in country music worldwide. The past can't be changed, by bickering over bad blood between people that we liked or disliked, so be happy and honor them in your hearts. Dragging deceased people though the mud and all the he said she said can't be changed. Let these brothers RIP! Just be happy that they gave the world two great and wonderful voices. There's an old saying, "you can kill more flies with honey than you can with vinegar." In other words kill them with kindness and they will someday understand all their anger has been shameful and disgusting. Don't be angry, cherish their memory. We can't change the fact, that they aren't hall of famers, just hope in your heart they will someday be honored there. If I have caused any ill will to anyone with my opinion, I truly apologize.